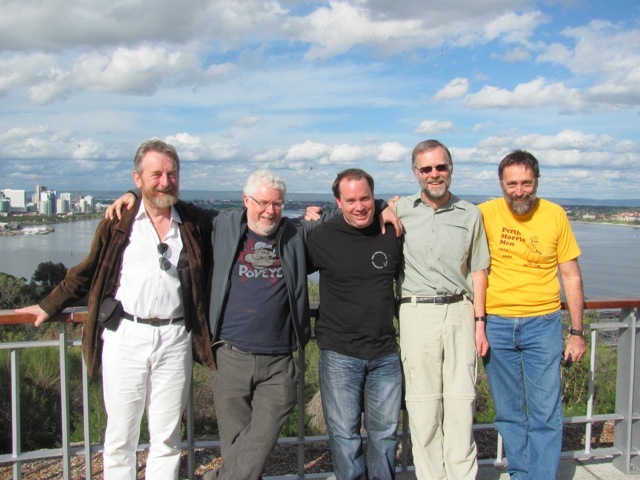 Our last visit to Perth in 1985 was so enjoyable, we decided to go back. 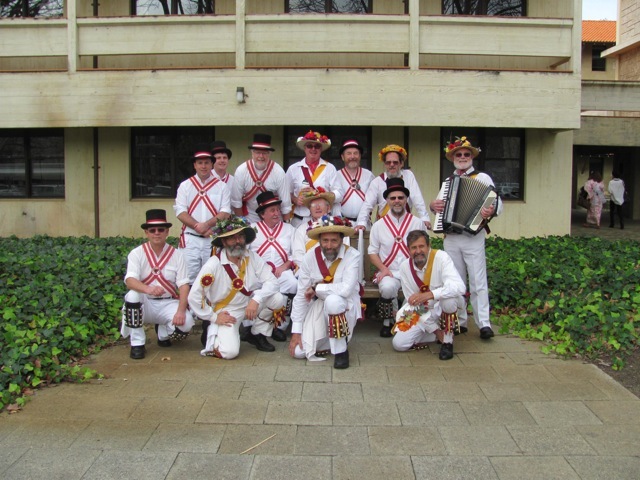 Perth must be the most isolated morris team as we were the first side to visit for over 25 years. 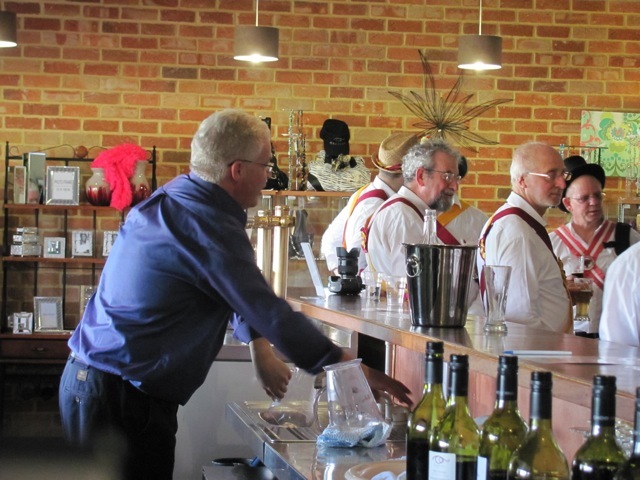 The choice of a tour of the Swan Valley was influenced by several successful forays over the years when I was there. WA has around 40 breweries and brewpubs so choosing breweries can be fun. We were picked up from the airport by Steve for a quick Cook’s tour to Kings Park. I had friends to catch up with so started the brewery tour early with a session in the Moon and Sixpence, the home of Nail Ale. Also I couldn’t resist calling in to the Sail and Anchor for a superb hand-pumped IPA all the way from the back room. 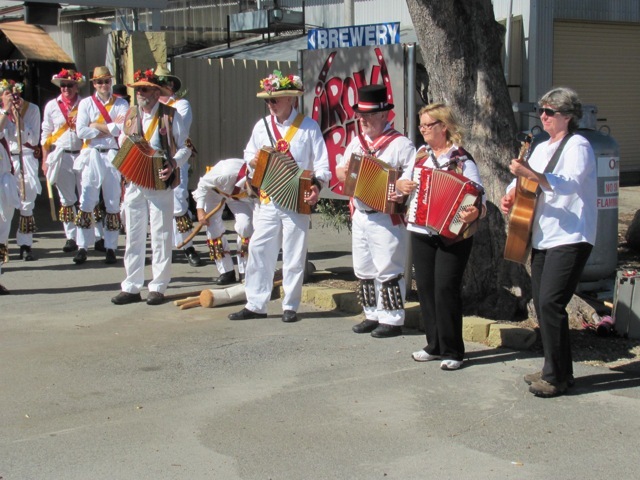 The “meet and greet” was in Little Creatures at Fremantle, which is a very Morris friendly haunt, they actually want the Morris on a regular basis. 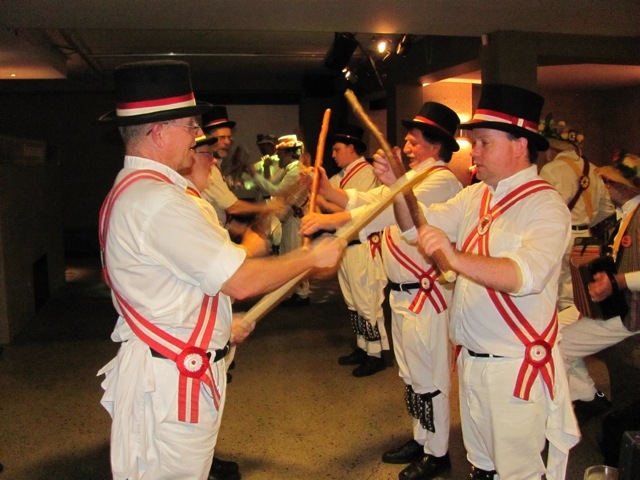 We managed a number of dances in the main room and the new extension including the realisation that the Lichfield Heys done by Perth and Adelaide are incompatible. We were also joined by a couple of Fair Maids who turned out for the second time in about the last 10 years. We would have been joined by Dave Smith if he had caught the plane. Copious quantities of Pale Ale including quantities on the house were enjoyed along with donated pizzas. Saturday morning found us in better condition than we deserved. A number caught the train to Guildford where our luxury charabanc was to pick us up. We had to make do with coffee as the historic pub remains a burnt out historic ruin, now with the fencing festooned with dirty socks to protest the slow progress. 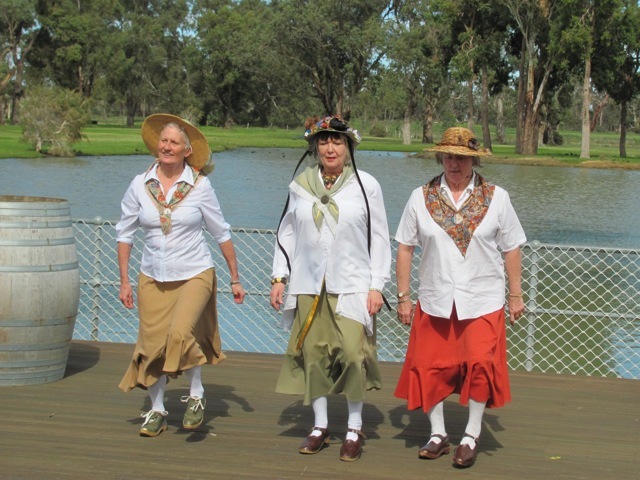 There were around 40 on the tour with Fair Maids of Perth along with Perth MM and Adelaide MM both out in strength. A short hop brought us to the Ironbark Brewery. It was initially considered not going here but the howls of protest brought it back and we could see why. A fine range of ales including one of several excellent IPA style (don’t ask me about other styles! ), more food than we could eat and a good dancing spot. The crowds were beginning to arrive as we left. Next stop was Oakover, a winery with a beer bar sourced from local micros. A picturesque dancing spot on the boardwalk over the lake was inhabited by ducks ignoring the no-swimming signs. The boardwalk particularly suited the cloggies. We finished up with a massed Abram. A jug of each of the ales on tap was well received and enjoyed. 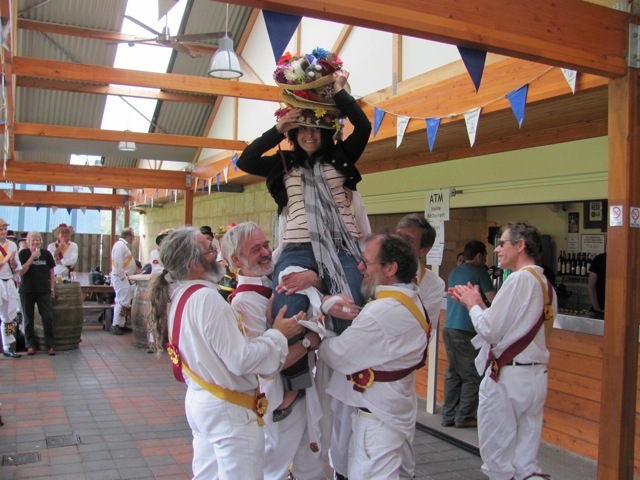 Then off to Elmars brewery, fondly remembered by Perth where the last visit coincided with the barmaid’s hen party. The resident muso took a welcome break as we entertained out at the back. Last day session, off to the Feral, a morris favourite, country pub style with some wonderful ales. The place was packed as usual and they had added a marquee full of happy samplers. They also had a stretch limo full of pub crawlers in fancy dress so we didn’t look too odd. The range of ales, especially the Pales impressed those new to Feral. If we had been allowed to stay, we would have but we were taken back to Guildford for trains and cars and a cuppa before hitting the delights of Broadway. 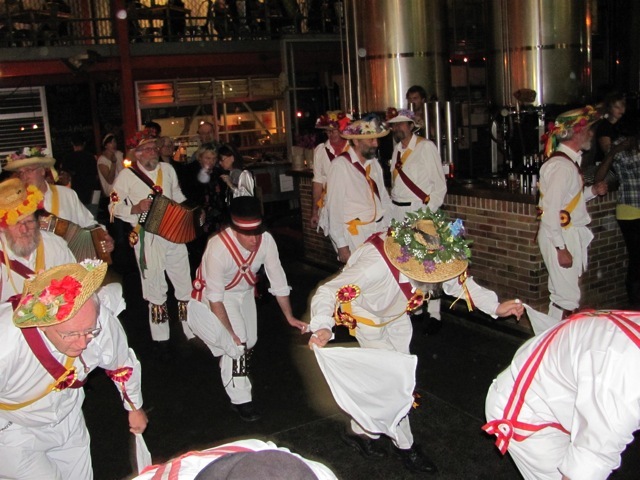 Perth Morris used to go to KK’s in the Broadway shops after practice to sample Darling Range Ales. We danced there on the last night before a couple of years of renovations. It is now the Basement and unrecognisable from its previous layout. A dance floor and balcony area made it a perfect venue for an ale, though the food service was incredibly slow for a simple menu. The crowd here arrives late so we had the place almost to ourselves till late. No micros here though the Fat Yak was in good form. Despite a long hiatus, the sword dance went well. On Sunday morning a cooked breakfast on the Swan was prepared ably by a joint culinary team. We drove there through blasting rain but it stayed fine enough and cleared up to a really nice day. 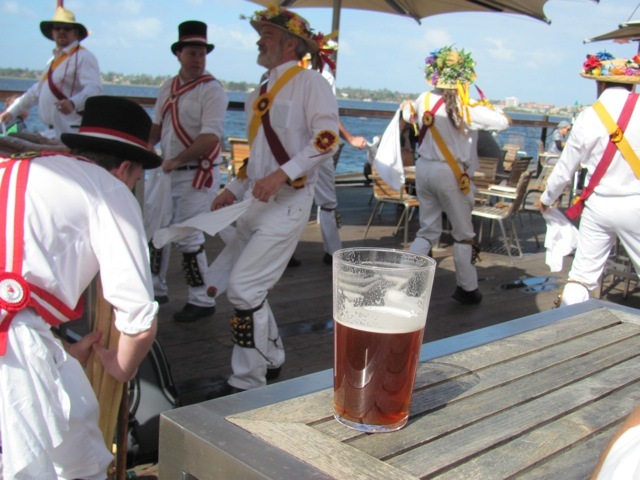 We had a good set on the very bank of the Swan while we were still sober then, in a moment of madness, gatecrashed the UWA open day with a few dances, before heading for the Lucky Shag for pints of Sharps Doom from Cornwall. This was the dance till you drop or have to leave for the airport session. About your recent trip to Perth, I remember as a young kid of being in the city one day with my mother, and happened upon seeing men, dressed in white with matching hats on, dancing in Forest Place (a city precinct)! I could hardly believe my eyes – and it looked like the gents then (as now) were having some fun too! 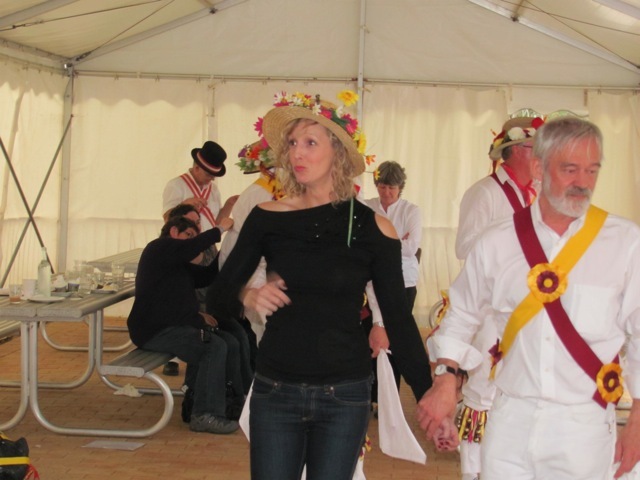 Since then (and that was 55 years ago at lest by now), I have continued to being both fascinated and intrigued by Morris dancing and of its history! Concerning your trip to Perth (WA) this past August, I just wish I had had the opportunity to see you perform.